Apex 1/4'' hex power drive bit holder for 1/4'' hex insert bits from Cooper Tools. Overall Length (in): 2'' Overall Length (mm): 51mm Special Note: Magnetic bit holder. Apex 1/4'' hex power drive bit holder for 1/4'' hex insert bits from Cooper Tools. Overall Length (in): 2 31/32'' Overall Length (mm): 75mm Special Note: Magnetic bit holder. Apex 1/4'' hex power drive bit holder for 1/4'' hex insert bits from Cooper Tools. Overall Length (in): 3 3/32'' Overall Length (mm): 79mm Special Note: Magnetic bit holder; 3/8'' (9.5mm) reduced diameter. 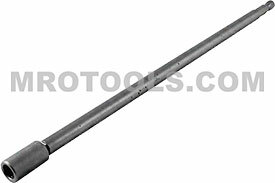 Apex 1/4'' hex power drive bit holder for 1/4'' hex insert bits from Cooper Tools. Overall Length (in): 4'' Overall Length (mm): 102mm Special Note: Magnetic bit holder. Apex 1/4'' hex power drive bit holder for 1/4'' hex insert bits from Cooper Tools. Overall Length (in): 6'' Overall Length (mm): 152mm Special Note: Magnetic bit holder. Apex 1/4'' hex power drive bit holder for 1/4'' hex insert bits from Cooper Tools. Overall Length (in): 8'' Overall Length (mm): 203mm Special Note: Magnetic bit holder. Apex 1/4'' hex power drive bit holder for 1/4'' hex insert bits from Cooper Tools. Overall Length (in): 10'' Overall Length (mm): 254mm Special Note: Magnetic bit holder. Apex 1/4'' hex power drive bit holder for 1/4'' hex insert bits from Cooper Tools. Overall Length (in): 12'' Overall Length (mm): 304mm Special Note: Magnetic bit holder. Apex 1/4'' hex power drive bit holder for 1/4'' hex insert bits from Cooper Tools. Overall Length (in): 3 1/4'' Overall Length (mm): 83mm Special Note: Magnetic bit holder; for Flip-Tip reversible bits. Apex 1/4'' hex power drive bit holder for 1/4'' hex insert bits from Cooper Tools. Overall Length (in): 2 7/8'' Overall Length (mm): 73mm Special Note: Magnetic bit holder; 3/8'' (9.5mm) turned shank. Apex 1/4'' hex power drive bit holder for 1/4'' hex insert bits from Cooper Tools. Overall Length (in): 2 7/8'' Overall Length (mm): 73mm Special Note: Magnetic bit holder; nose piece only, #490-RN. Apex 1/4'' hex power drive bit holder for 1/4'' hex insert bits from Cooper Tools. Overall Length (in): 4'' Overall Length (mm): 102mm Special Note: Magnetic bit holder; nose piece only, #490-RN. Apex 1/4'' hex power drive bit holder for 1/4'' hex insert bits from Cooper Tools. Overall Length (in): 6'' Overall Length (mm): 152mm Special Note: Magnetic bit holder; nose piece only, #490-RN. Apex 1/4'' hex power drive bit holder for 1/4'' hex insert bits from Cooper Tools. Overall Length (in): 2'' Overall Length (mm): 51mm Special Note: Magnetic bit holder; with O-Ring retainer. Apex 1/4'' hex power drive bit holder for 1/4'' hex insert bits from Cooper Tools. Overall Length (in): 3'' Overall Length (mm): 76mm Special Note: Magnetic bit holder; with O-Ring retainer.